Two passenger trains derailed during a flash flood in central India, killing at least 24 people and injuring scores more. The derailments occurred around midnight Tuesday when the trains were crossing a small bridge near the Machak River in Madhya Pradesh state. 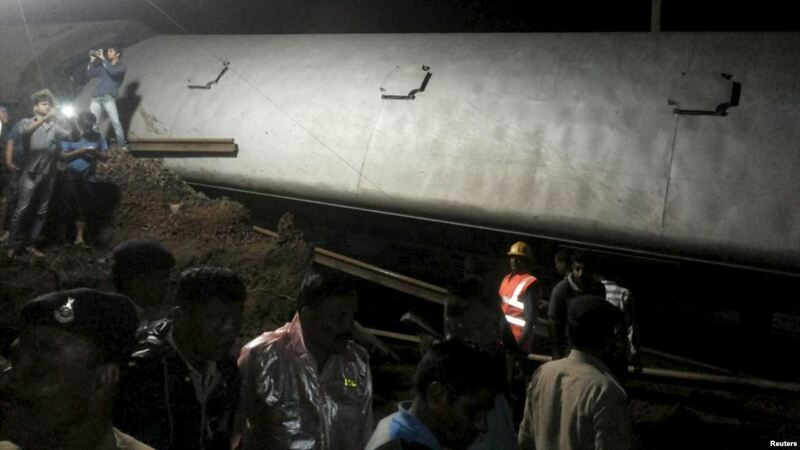 "While approaching the culvert, the track, it caved in because of the heavy rains and wet soil," Indian Railways spokesman Anil Saxena said. Darkness complicated the search for the passengers, some of whom were stuck in train carriages half covered in mud and lying on their side in a field. By morning, authorities said more than 300 passengers had been rescued, although there were fears the death toll could rise. "My prayers [are] with the injured," said Indian Prime Minister Narendra Modi via Twitter. "Authorities are doing everything possible on the ground. The situation is being monitored very closely." "The two train accidents in Madhya Pradesh are deeply distressing. [I am] deeply pained over the loss of lives. Condolences to families of deceased," Modi added. Accidents are common on India's railroad network, which is one of the world's largest and carries more than 20 million people per day.